Too bad, really, that Elvis' performance isn't on the same very high level of quality as the sound and artwork on this marvelous release from DAE. In fact, I rank this as among the poorest shows I've heard with the man, although I have to admit that it's much better than, say, the shows from the later part of 1974. 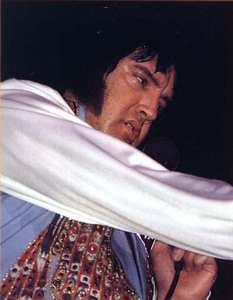 Hearing Elvis live is almost always a great pleasure, but on this album it's very obvious that he is very out of shape. The voice is thin and weak and most of the songs are presented in a throwaway fashion. That shouldn't stop the die-hard Presley collectors from investing some hard-earned cash, though. Like I stated above, the sound quality is incredibly good, perhaps the best soundboard ever released. The artwork is also of topnotch quality with several color pictures from the actual show (According to others these pictures are not from Tuscaloosa, but one earlier show...Oven Egeland). But the pictures also indicates that this isn't Elvis at his healthiest or best looking. I still hold the opinion that if you're gonna get just one "import" album from 1976, then go for "Burning In Birmingham" if you're looking for an inspired Elvis. But if perfect sound is more important, well, then I guess that "Old Times Are Not Forgotten" is the one you should go for. Soundboards don't get any better than this from a technical point of view and out of shape or not, it's still Elvis. And that's probably the fact that matters most to us. All Elvis fans know that Elvis in 1976 was no longer able to be like the still convincing performer of for instance March 1974. His shows were often affected by his health problems, and in summer 1976 he showed clearly and unequivocally. It's the case of this CD which contains the almost entire (only two songs,"America The Beautiful and My Heavenly Father", this one performed by Kathy Westmoreland, were omitted ) show from Tuscaloosa, Alabama, August 30, 1976. 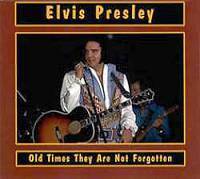 What is surprising is that this concert is really good if compared to the weakest point Elvis reached in Hampton Roads only thirty days before, where his voice is unrecognizable and the show is maybe the worse ever. On the other hand, Elvis voice in Tuscaloosa is still weak, but better than in Hampton. Most of the songs are not performed the way he could. Only And I Love You So and Love Letters are well delivered. Elvis is tired, I still wonder how he could perform in such conditions. The medley"Mystery Train-Tiger Man" is maybe the lowest point, with Elvis ( in my opinion ) unable to sing it as only one year before. What is great of this release is the sound. I agree with those who think that the sound of this CD is better than many BMG releases. All the instruments are well balanced and despite the show itself is not memorable, it is still enjoyable to listen to. The show itself can instead be compared to the Tucson one Elvis gave three months before, even if in Tucson he was a lit better in my opinion. In conclusion, This is not Elvis at his best. If you want the greatest Elvis in 1976, just listen to "A Hot Winter Night In Dallas" or "Burning In Birningham", where Elvis showed that he will always be king.